Sunday October 17th 1920 Rob & Cora went away early to come down the river in a canoe. Hattie and I slept late. I was really too tired to rest well last night. She went to church. I was down at Otts awhile. William is better. I read some in afternoon. Monday October 18th 1920 I was busy sewing in forenoon. I went to town with Rob after dinner. Did some errands and went to the cemetery. I was there till nearly time to come home with Rob at 5 oclock. Such a fine day. Wrote Aunt Sarah in evening. 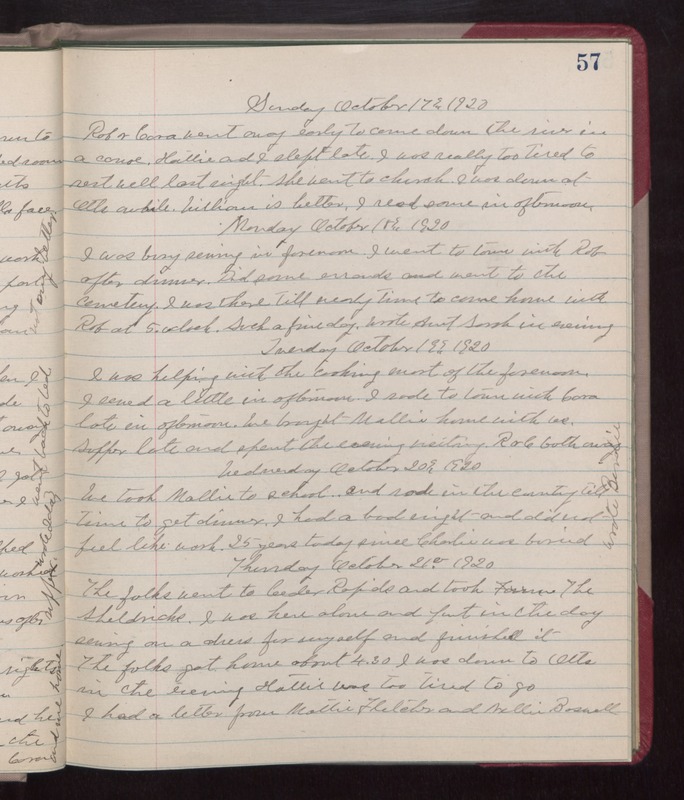 Tuesday October 19th 1920 I was helping with the cooking most of the forenoon. I sewed a little in afternoon. I rode to town with Cora late in afternoon. We brought Mollie home with us. Supper late and spent the evening visiting. R & C both away. Wednesday October 20th 1920 We took Mollie to school and rode in the country till time to get dinner. I had a bad night and did not feel like work. 25 years today since Charlie was buried. Wrote Birdie. Thursday October 21st 1920 The folks went to Cedar Rapids and took The Sheldricks. I was here alone and put in the day sewing on a dress for myself and finished it. The folks got home about 4.30. I was down to Otts in the evening. Hattie was too tired to go. I had a letter from Mollie Fletcher and Nellie Boswell.